The CDC came out with a brief 2 page report on kratom deaths 3 days ago (1). That was all it took for the Twitterati to proclaim that there were many more deaths from alcohol and I suppose there was a post about even more deaths from cigarette smoking but thankfully I missed that one. When I pointed out that it was clearly an addictive drug and lifelong disability (a very significant problem) may be the issue - the defenders of kratom stepped up and talked about how harmless it is and also how it is advantageous for people who cannot afford medication assisted treatment (MAT) (buprenorphine preparations, methadone, or naltrexone extended release injections) for opioid use disorder (OUD). The expected personal attacks and sarcasm followed. Kratom is an interesting compound because like many psychoactive botanicals there is a history (2). Kratom itself is basically leaf material from the kratom tree (Mitragyna speciosa). The leaves can be smoked or chewed. They can also be dried and powdered. The powdered form is what is typically available for sale. The powder can be packaged in capsules and taken orally, brewed into a tea, or rendered into a syrup and formed into pills. Fresh leaves can be chewed with or without betel nuts. Kratom has been used in Malaysia since the 19th century to “heal opium addiction”. A recent paper referenced a study of kratom users that were using an estimated 4-8 g/day (8). Converting based on typical leaf content means that these users would be exposed to a maximum of 120-180 mg mitragynine and 1.1 - 3.4 mg 7-hydroxymitragynine. Rӓtsch suggests in his text that “in studies with mice, even extreme dosages of 920 mg/kg did not produce any toxic effects”. He describes “self experiments” in the literature suggesting that kratom can be both stimulating like cocaine and sedating like opium. The only comment on addiction is “The alleged kratom addiction is a Thai cultural phenomenon” (p. 367). Like most intoxicants in the modern era there is progression to intravenous use. Although that is currently rare, there are case reports of intravenous use of kratom extracts. The CDC document describes a series of deaths in 11 states between July 2016 and June 2017 and an additional 27 states from July to December 2017. The data set was from the SUDORS (State Unintentional Drug Overdose Reporting System) and consisted of 27,338 overdose deaths, 152 (0.56%) of which were kratom positive. There is no standard postmortem toxicology protocol and as previously noted that is problematic in determining the drugs present in these analyses. As shown by the table from this report in 91 cases kratom was considered the cause of death, but numerous other substances were present. In seven cases kratom was the only substance noted in postmortem toxicology, but additional substances cannot be ruled out. A report in the New England Journal of Medicine, looked at 15 cases of death (4) associated with kratom in Colorado. In this series the authors used more rigorous toxicological analysis with high-performance liquid chromatography – mass spectrometry. Whole blood mitragynine concentrations were noted between 16-117 ng/ml and up to 4800 ng/ml. In this series, 14 of 15 deaths had multiple drugs leading the authors to conclude that these deaths were kratom related. This series of cases illustrates the importance of toxicological analysis and specifically plasma levels of the drug to correlate with various toxidromes and post mortem toxicology. The leaves of Mitragyna speciosa, contain multiple alkaloids including mitragynine, 7-hydroxymitragynine, paynantheine, speciocilatine, and speciogynine. The crude alkaloid extract consists primarily of 66% mitragynine and 2% 7-hydroxymitragynine. The extraction process may be protective against toxicity for many people that brew the leaves into a tea, chew the leaves, or ingest the powdered leaves as capsules but even then the concentration of these alkaloids may vary from species to species. Counting on an inefficient extraction process for safety is probably not the best idea. The other property of the raw material is that the alkaloids are mixtures of opioid receptor agonists and antagonists that may determine the net effect. Searching the way these products are sold there is really not much about concentration of any associated alkaloids other than mitragynine. The plant itself contains more than 40 unique alkaloids (8). Until recently, the pharmacology of mitragynine and 7-hydroxymitragynine were unknown. There is research to suggest (5) that opioid receptors mediated the primary effects. Both compounds had binding affinity for the mu opioid receptor (MOR). They were also active in tissue essays and blocked by naloxone. Some of these effects were inconsistent between laboratory species. Activity was reported at a number of non-opioid receptors as well. 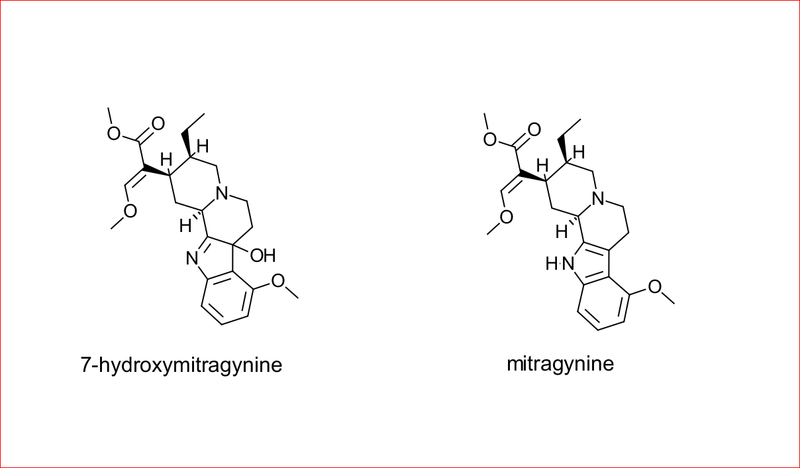 The pharmacology of mitragynine and 7-hydroxymitragynine is now well-characterized. Recent studies show that mitragynine is a partial agonist at the human mu opioid receptor (hMOR), and a competitive antagonist at the human kappa opioid receptor (hKOR), and an antagonist at the human delta opioid receptor (hMOR) but with very low potency. The authors studied these compounds against all three human opioid receptors looking at both functional activity (EC50 and IC50) and binding affinities (Ki) and discovered they were consistent across those experiments. 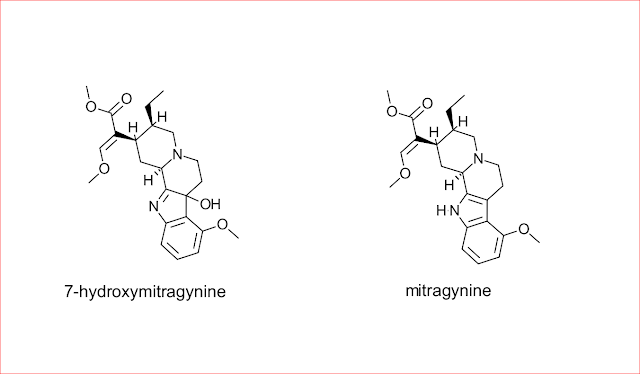 They concluded that mitragynine (0.233 μM) And 7-hydroxymitragynine (0.047 μM) had significant binding affinity for hMOR. The remainder of the paper focuses on medicinal chemistry theory, specifically how opioid -like compounds that bias intracellular signaling toward G proteins rather than β-arrestin may be better candidates for opioid analgesics with low addiction potential and better side effect profiles and possibly antidepressant activity. They synthesize a number of analogues and look at their agonist activity at hMOR. The authors conclude that the psychoactive activity of Mitragyna is most likely due to their action at hMOR. They also point out that due to the competitive nature of the alkaloids the gross effects will be due to that balance of agonism and antagonism. The alkaloid and methanol crude extracts of kratom are both inhibitors of CYP3A4 and CYP2D6 in vitro. No specific components have been identified with this activity and there has been in vivo confirmation (8). Another paper (6) looks at the “unanticipated toxicity” of kratom. This group looked at the LD50 of mitragynine, 7-hydroxymitragynine, and heroin. The LD50 is a measure of acute toxicity and what single dose will kill half of the research animals. In this case mice were used and the researchers were surprised to find that an intravenous dose of either mitragynine or 7-hydroxymitragynine were as lethal as heroin. No lethal doses were observed for oral dosing in a range of 6.25-50 mg/kg. the lethal intravenous dose was midpoint in that range. Researchers observed that the mice appeared to die from respiratory depression within 10 minutes of direct exposure. In the surviving mice many were noted to have seizures in the first 20 minutes. In a separate review, the authors point out that with a typical 8 g dose of kratom powder, the levels of 7-hydroxymitragynine, may be too low to cause a pharmacologically relevant effect at the opioid receptor. The research on kratom has elucidated receptor activity in opioid receptors. The activity is complex but the mu opioid receptor is clearly involved and is the likely site of the psychoactive effects and the application of opioid substitution in people with addictions. The receptor effect is complicated and likely involves more than the mu opioid receptor. The research also suggests that activity at murine and human opioid receptors are not equivalent. Persons acquiring kratom in the powder form need to consider that the ratio of mitragynine to 7-hydroxymitragynine likely varies with species and source. The 7-hydroxymitragynine is 52 times as potent as mitragynine at the MOR and 13 times as potent as morphine. Products made from extractions will be more potent. All of this information should create skepticism in prospective kratom users. As addiction psychiatrist I can attest to the fact that it is addicting and with any addiction there is a tendency to escalate the dose. Many people with addictions as noted in the above table are using multiple substances some of which are also agonists at the opioid receptor. If you are considering kratom as a treatment for opioid addiction or chronic pain there are much, much safer and effective ways to proceed. 2: Rӓtsch C. The Encyclopedia of Psychoactive Plants: Ethnopharmacology and Its Applications. Park Street Press. Rochester, Vermont, 2005. pages 366-367. 4: Gershman K, Timm K, Frank M, Lampi L, Melamed J, Gerona R, Monte AA. Deaths in Colorado Attributed to Kratom. N Engl J Med. 2019 Jan 3;380(1):97-98. doi: 10.1056/NEJMc1811055. PubMed PMID: 30601742. 5: Kruegel AC, Gassaway MM, Kapoor A, Váradi A, Majumdar S, Filizola M, Javitch JA, Sames D. Synthetic and Receptor Signaling Explorations of the Mitragyna Alkaloids: Mitragynine as an Atypical Molecular Framework for Opioid Receptor Modulators. J Am Chem Soc. 2016 Jun 1;138(21):6754-64. doi: 10.1021/jacs.6b00360. Epub 2016 May 18. PubMed PMID: 27192616; PubMed Central PMCID: PMC5189718. 6: Smith LC, Lin L, Hwang CS, Zhou B, Kubitz DM, Wang H, Janda KD. Lateral Flow Assessment and Unanticipated Toxicity of Kratom. Chem Res Toxicol. 2018 Nov 16. doi: 10.1021/acs.chemrestox.8b00218. [Epub ahead of print] PubMed PMID: 30380840. 8: Kruegel AC, Grundmann O. The medicinal chemistry and neuropharmacology of kratom: A preliminary discussion of a promising medicinal plant and analysis of its potential for abuse. Neuropharmacology. 2018 May 15;134(Pt A):108-120. doi: 10.1016/j.neuropharm.2017.08.026. Epub 2017 Aug 19. Review. PubMed PMID: 28830758. "Based on these test results, the typical long-term kratom user could potentially develop heavy metal poisoning, which could include nervous system or kidney damage, anemia, high blood pressure, and/or increased risk of certain cancers." 1. Mitragynine and 7-hydroxymitragynine were done with ChemDoodle. 2. Table of from the CDC per reference 3 and public domain. The person I was talking with had been discharged from a hospital about two months ago. He was admitted there because of an exacerbation of a mood disorder and possible psychosis. The main reason he was admitted from the emergency department was suicidal ideation. That is the most frequent indication for hospital admissions in the United States. Even then who does and does not get admitted is controversial. It is common for persons to be sent to the emergency department by their families or outlying facilities where there are legitimate concerns only have the patient deny the problem and get released from the hospital. There is a lot of drama involved because one of the decision points is whether or not suicidal person needs to be placed on legal hold and treated on an involuntary basis. This frequently leads to speculation about the true nature of what a person says or alternatively accepting "no suicidal thinking" at face value and dismissing them. Depending on where you practice clinics have different conventions about this item and how it needs to be approached. Any elevation usually leads to a more intensive assessment of suicide potential. That typically involves a clinical interview but also could involve the use of another checklist. It should be apparent that this item is a focused on the approximate frequency of suicidal thinking. It assumes that the patient can actually report this and that it is more significant than other metrics like the intensity of thinking. For example, is one extremely intense thought about suicide more significant and potentially lethal than thinking about it frequently but easily dismissing those thoughts? This is one of the basic limitations of any assessment of the person’s mental status. Clinical interviews and rating scales are very crude approximations of a person’s conscious state. Assessing someone’s potential for suicide is a clear example. There is also the notion of rating scales being “quantitative” measures and they are not. There is an entire field of research suggesting that these “measurements” lead to greater precision and I doubt that is true. All of that brings me back to the first patient. Here he is somewhat annoyed that nobody seemed to realize on an inpatient psychiatric unit that he was trying to kill himself. At the same time he made every effort to conceal that fact while he was hospitalized. He only disclosed it months later after his mood and associated cognitive processes had stabilized. It reminds me that I also have talked with many people who were intent on killing themselves and presented themselves as being very well so that they could be discharged and attempt suicide. The popular literature is full of stories about people who reassured their families or appeared to be doing well only to carry out a planned suicide attempt. This is clearly a high risk conscious state that can escape detection and lead to very high risk attempt or death. I talked to many survivors of gunshot wounds that were self-inflicted. In large trauma hospitals, psychiatrists are consulted by surgery services who have successfully treated the patient. The psychiatrists job is to assess the patient and determine whether or not they need further acute psychiatric care or they can be discharged home. I generally ask for a very detailed description of what happened including the type of firearm used, the time of day, the associated thought process, the overall psychiatric context, and the sequence of events just before the firearm goes off. The common explanation that I have heard is a recollection that someone was pointing a loaded gun at themselves and that at some point it "just went off". There is no recollection of a conscious effort to pull the trigger. Numerous secondary analyses are possible including that it is just a rationalization against self-harm or an attempt to avert psychiatric hospitalization. In keeping with the theme of this post - there is also a possibility that the patient’s conscious state at the time of the suicide attempt was so chaotic that it cannot be recalled or reconstructed. There is precedent for that state and that is delusional depression. If the patient is clearly delusional all of the usual deterrents like fear of dying, intense dislike of pain, not wanting to harm the family, and religious beliefs no longer apply. The standard risk analysis for suicidal thinking no longer applies. There is a delusional process with associated emotions that lead to very high suicide risk. The delusional process can be very subtle. Psychiatrists are typically taught to pay attention to hallucinations and classic forms of delusions. Those types of psychotic thinking are fairly obvious. In the case of depression and some forms of psychosis the delusion can be very subtle. An example might be feeling guilty about a trivial event from a long time ago. Everyone can relate to that kind of guilt or embarrassment but what if it is suddenly linked to the idea that death is preferred to the emotional burden of that trivial event. People in their 50s, 60s, and 70s could focus on events that happened when they were in middle school or high school that might start to disrupt their lives and lead to suicidal thinking. In the example given a severe suicide attempt occurred by self-inflicted stab wound over a trivial incident happening in the eighth grade. The patient was unable to recognize that this was a delusional thought process until the depression and psychosis had been adequately treated. These examples all highlight how a person can go from being no risk at all for suicidal behavior to being at very high risk. The changes are subtle and they might not be apparent to the person experiencing them. The risk analysis models that are used are all linear and additive and do not capture the conscious states of people who become suicidal. The limited consciousness theories that we currently have would suggest that it is really not possible to experience the conscious state of another person in the transition to high suicide risk is probably a good example. Even the best possible definition of empathy fails if the person cannot recognize the state that the psychiatrist is trying to reflect back to them. Time domain is another perspective on the fluidity of conscious states both in the case of suicidal thinking and substance use disorders. It is common for a person to describe themselves as becoming a person that they never wanted to be associated with both substance use disorders and suicidal thinking. They are able to see those patterns in retrospect but not at the times they occur. It may be apparent that suicidal thinking can be a transition from a questionable belief to certainty. I listed a few of these beliefs in a previous post. A common one is “people would be better off without me”. In the early stages most people can examine that thought and conclude that it is at least partially false based on their relationships to the people in question and the assessment of their realistic value to those people. With time and continued emotional intensity any objective assessment of their value in relationships might diminish and disappear. At that point they are in a very high-risk state because they believe in the statement that “people would be better off without me”. Clinicians are often taught to ask about deterrence to suicidal ideation, but they are rarely taught to assess the degree of belief a person has in high-risk suicidal thinking. There are non known ways to determine is a person who is delusional or quasi-delusional about suicidal thoughts is disclosing those thoughts or hiding them. What can clinicians and patient do in these circumstances? My previous posts suggests that an analysis of the thought patterns can be useful. I routinely review those ideas with people I see who have suicidal thoughts. At some point the goal would be to see if talking about suicidal thoughts in this way would improve the level of resistance to these thoughts and make it less likely that people will act on them. I also believe that a public health message should discuss the same approach, So far the only public health measure seems to be advice on calling suicide hotlines or crisis lines. I have had several people who I know as friends let me know that they have been able to analyze these thoughts on their own and come up solutions to contain these thoughts and get enough emotional distance from them to the point that they were no longer bothersome. I know it can be done and encourage public health officials to take it to the next step. In closing, this post emphasizes a unique conscious state or states associated with suicidal ideation and suicide attempts. Nothing in this post should be construed as interview or treatment suggestions. A more comprehensive understanding of suicidal thinking and behavior requires more than a rating scale approach or risk factor analysis. One of the main reasons for me writing this blog is to discuss medication safety and adverse effects. This is no small task since the orientation of most research and clinical work is making a diagnosis and where appropriate selecting the correct medication. A lot of work goes into those determinations but an equal amount of work needs to be directed toward managing common adverse effects and preventing serious adverse effects/events of the medication. In order to do that practitioners need to realize that they are treating a genetically diverse population. That means there will always be a subgroup of people who cannot tolerate medications. There will also be a subgroup of people who respond very well to medications and variations in between. A good example is selective serotonin reuptake inhibitors (SSRIs). These medications are commonly first-line agents for depression and anxiety. About one person out of every seven will not be able to tolerate them. The same is true of every major class and psychiatric medications. That is a source of frustration for practitioners because it means that even if the correct diagnosis is made the optimal medication may not be available because the person cannot tolerate it. In the case of SSRIs, a person may not be able to tolerate any other medication in that class. In addition to genetic heterogeneity affecting the pharmacokinetics and pharmacodynamics of drugs, patients are also taking other classes medications and have other medical morbidities that may contraindicate the use of certain psychotropic medications. In the case of bupropion, any history of eating disorder or current eating disorder, any seizure history, and any traumatic brain injury that may predispose to seizures are contraindications to using that medication. Appropriate medical care requires that practitioners are aware of all of the contraindications and precautions listed in FDA package inserts for medications. What about the case of a healthy young person with no medical comorbidity who needs treatment for depression or anxiety. What is important for that person to know in order to safely take that medication? What should be explicitly discussed with them? What constitutes adequate informed consent? What can be done in the time a practitioner has to make the diagnosis and educate the patient? These are not trivial questions since most practices are scheduling patients every 15 minutes in some cases new patients are seen for 30 minutes. All that makes it seem like psychopharmacology is a very easy job but the information transfer during the sessions is critical and there is plenty of evidence that it is inadequate. There is an excellent discussion of the problem by Rajnish Mago, MD in the references (2). He considers a number of ways to assess and manage adverse effects including open-ended questions, checklists administered to the patient, structured interviews by clinicians, and spontaneous reports by patients. His review of this literature shows that the sensitivity and specificity of all of these methods are lacking and some of them take so much time they could not be applied clinically. He gave as an example of structured interviews administered by clinicians that take up to 60 minutes just to determine the adverse effects. The other problem with determining the adverse effects is whether or not they can be attributed to the medication that has been prescribed. In clinical trials, researchers often estimate whether adverse effects/events are due to the medication or not. In practice that is a difficult determination due to both placebo and nocebo effects. Vital signs and laboratory measures can also constitute adverse effect measurements. In psychiatry liver function tests, renal function including plasma creatinine and estimated GFR, CBC and ANC, TSH, T4, basic metabolic profile, electrocardiograms, and EEGs are all metrics that can be followed to determine medication effects. Vital signs should also be routinely done on anyone taking medications to check for effects on blood pressure, heart rate, and heart rhythm. Those measurements constitute more specific measures that could lead to clinical action. There has been some emphasis on measurement-based practice that involves the extensive use of rating scales. Many of the authors in this area seem to mistake rating scales as both objective and quantitative measures when they are neither. I remain unconvinced that this is the best approach and think that it has resulted in the over medication of large numbers of people who have a certain rating scale score but no diagnosis. There has been very little discussion of the analysis of longitudinal data and what these rating scale scores actually mean. The controversy in this area applies to both the diagnostic indices as well as the side effect indices. My approach in dealing with side effects is that they should be completely eliminated wherever possible and that irreversible adverse effects need to be avoided. Dr. Mago’s paper reviews recommendations for improving adverse effect reporting and clinical trials and also his recommendations for clinical practice that basically come down to telling patients about all adverse effects that occur at a rate 5% greater than placebo and all potentially serious for life-threatening adverse effects even if they are rare. I am in complete agreement with those recommendations, and even have an approach that can work. It does require a degree of vigilance on the part of the clinician. The attached table suggests why vigilance is required. Psychiatrists need to be more vigilant than most physicians because no patient is expected to get complications or die as a direct result of our treatments. That historically has led the field to have a lower threshold for monitoring for potential side effects. Given all of these constraints and the complexity of the situation is there a way to provide adequate informed consent about the medications that we prescribe? I am talking about all physicians here and not just psychiatrists. I think there is and I will walk through my process. 1. I preface my remarks with my experience prescribing the medication: For example with common medications like naltrexone I will give an estimate of the percentage of people that tolerate the medication very well and the percentage that stop taking it and why. That sets an expectation that a medication may or may not be well tolerated as a probability statement and that some people stop it because of adverse effects. 2. I encourage people to do their own research. Anyone can pull up the FDA package insert on any medication these days by Googling: "[medication name] FDA package insert". I tell them what to expect. I also tell them that I should be able to explain anything they find on the Internet about the medication if they have any questions or concerns. In the case of polypharmacy scenarios, I point out that the extremes of low doses and high doses of two agents and all of the combinations in between can be found this days with stated results ranging from very positive to very negative for the entire range of doses. I also have the position that they can take as long as they want to do their own research and that in the meantime - no medication needs to be prescribed. 3. I will discontinue the medication at any time and I am very explicit about that. I do not expect anyone to "get used to" side effects because in my experience too many people get used to side effects and live with them on a long term basis. I provide examples to illustrate the idea of living with side effects. 4. I give them the MedlinePlus handout on the medication or show them how to get it. The MedlinePlus handouts are really a product of American Society of Health-System Pharmacists (ASHP). I have emails both into MedlinePlus and AHSP inquiring about the process they use to determine the bullet points for the listed precautions and tiers of side effects. At the time of this post I have not been contacted by either organization. 5. I tell them the common side effects, contraindications to the medication, and precautions - specially if they are on a medication or have a medical condition that is flagged in the precaution section. "Reactions are categorized by body system according to the following definitions: frequent adverse reactions are those occurring in at least 1/100 patients; infrequent adverse reactions are those occurring in 1/100 to 1/1000 patients; rare reactions are those occurring in fewer than 1/1000 patients." "If I had mentioned that problem like I usually do would it have led to a more timely intervention to reduce the adverse effect?" That is a question that most physicians don't want to keep asking themselves and it is why my vigilance is high. 1: Bloom R, Amber KT. Identifying the incidence of rash, Stevens-Johnson syndrome and toxic epidermal necrolysis in patients taking lamotrigine: a systematic review of 122 randomized controlled trials. An Bras Dermatol. 2017 Jan-Feb;92(1):139-141. doi: 10.1590/abd1806-4841.20175070. PubMed PMID: 28225977; PubMed Central PMCID: PMC5312199. 2: Mago R. Adverse Effects of Psychotropic Medications: A Call to Action.Psychiatr Clin North Am. 2016 Sep;39(3):361-73. doi: 10.1016/j.psc.2016.04.005. Review. PubMed PMID: 27514294. 3: Tse L, Barr AM, Scarapicchia V, Vila-Rodriguez F. Neuroleptic Malignant Syndrome: A Review from a Clinically Oriented Perspective. Curr Neuropharmacol. 2015;13(3):395-406. Review. PubMed PMID: 26411967; PubMed Central PMCID: PMC4812801. Cardiology factors prominently in psychiatry and psychiatric care. I have been fortunate on many occasions to work with psychiatrists who were also cardiologists and to have access to outstanding cardiologists as consultants. That gave me a great appreciation for what was possible in the detection treatment of cardiac problems. It also help me appreciate the importance of treating psychiatric disorders in patients with cardiac problems. The recognition that some medications can cause problems and the need for ECG screening was another change in psychiatric practice. Prior to that knowledge, there were some medications that delayed cardiac conduction to the point that they are no longer used. One of the commonest scenarios I currently see is at the interface of anxiety and the effect it has on the heart. About 20 to 30% of the people I see have severe anxiety and panic attacks. About two thirds of them have made at least one trip to the emergency department because they thought they were experiencing a heart attack. They are generally young people with limited cardiac risk factors. When I asked them about the symptoms that led them to the ED, the most common answer is “my heart was pounding out of my chest and I thought I was having a heart attack”. Palpitations are another common symptom. They are harder to get at and people who have talked to cardiologists are better at describing them. I demonstrate by making an irregular thumping noise on my chest with my hand to indicate what it might feel like. The associated symptoms of panic attacks like swelling, lightheadedness, dizziness, chest tightness, shortness of breath, hyperventilation, and dizziness all reinforce the thought of a heart attack. Once the ED staff determine the patient is having a panic attack the way they are educated is critical in reducing ongoing symptoms. But that is another story. An associated symptom in anxiety is what I like to call “cardiac awareness”. It happens in anxious people whether they have an anxiety disorder diagnosis or a stressor making them anxious. Laying in bed at night waiting to fall asleep many people can sense their heart beating without taking their pulse. They can sense other pulse points in the body and frequently they can sense large pulsations. This is a normal physiological process but anxiety can lead to a focus on it. I also lead to attaching other meetings to it such as the occasional palpitation is seen as evidence of heart disease leading to increased anxiety. In that situation it becomes very difficult to sleep leading to more anxiety and frequently - a faster heart rate the next day. Cardiac pathology can compound the problem because there are various conditions like atrial fibrillation that can lead to people paying much more attention to their heart rate and rhythm. Atrial fibrillation is interesting in that regard because there are two management strategies. In a rate control strategy the person is given a medication to generally keep their heart rate less than 100 bpm but the rhythm could still be irregular and experienced as frequent palpitations. In a rhythm control strategy the person is either given a medication or treatment to maintain a regular sinus rhythm and palpitations would be much less frequent to nonexistent. Current thinking on treating atrial fibrillation is that the outcomes of both strategies are equivalent in terms of mortality but that patients with a rhythm control strategy rate themselves as having a higher quality of life. That brings me to the New England Journal of Medicine case listed in the references below. This case continues a recent trend in incorporating more psychiatric expertise into these cases with psychiatrists as discussants. The patient was a 62-year-old man with depression and anxiety. The depression dated back 15 years with onset after he learned that his wife had cancer. His wife eventually died. Whichever psychiatrist are about seven years and eventually found that citalopram and clonazepam are effective. He continued with his primary care physician and eventually discontinued the citalopram. He was seen by one of the discussants due to recurrent anxiety depression and lethargy. Vital signs were noted to be abnormal with an irregular pulse of 130 bpm blood pressure 108/75. An ECG was done that showed new onset of atrial fibrillation. Echocardiography showed an enlarged left atrium and left ventricle, low normal LV ejection fraction, mild left ventricular hypertrophy, and no valvular disease. The subsequent ECG showed a prolonged QTc interval of 466 ms. At a subsequent visit he had an additional significant stressor also had started to binge drink. At that time he had weekly panic attacks that correlated with increased alcohol intake. When he was seen in the psychiatric clinic had weekly panic attacks that consisted of “racing heart, lightheadedness, restlessness, shaking, and generalized weakness and so the episodes lasted for several hours. A family history of depression and suicide was noted. He was noted to be drinking 4 to 6 standard drinks per week with occasional binges. Aripiprazole was added to the clonazepam and citalopram. The patient subsequently had a near syncopal episode three weeks later I was noted to be hypertensive and tachycardic. The ECG showed atrial fibrillation and sinus pauses of six and seven seconds. A permanent pacemaker was placed in the metoprolol was discontinued. He was noted to be improved on the psychiatric medication changes but the metoprolol is discontinued because of fatigue. Three weeks later he had increasing anxiety and the feeling that his heart was racing and “thumping” in his chest and that he was excessively worried. They aripiprazole was increased at that time. Like most of these cases there is a differential diagnosis exercise included and the discussant in this case is a psychiatrist. The exercise focuses on the fact that the central symptoms in this case-anxiety, palpitations, racing heart, restlessness, and fatigue are not specific for cardiac or psychiatric diagnosis. In fact all DSM diagnoses included criteria to rule out any medical causes of the syndrome. In this case all the usual suspects are discussed. From the medical side hyperthyroidism, return atrial fibrillation, dilated cardiomyopathy, Torsade de pointes, and rare medical causes are discussed. The duration of the patient’s symptoms rules out a lot of the acute causes. From psychiatric standpoint panic disorder, substance intoxication, and substance withdrawal were the primary considerations. The discussant Dr. Chen uses the term that we don’t hear enough of lately and that is parsimony specifically “The best diagnosis would parsimoniously explain the patient’s symptoms and the time course of his illness”. He concludes that there is a clear correlation with discontinuing metoprolol and experiencing recurrent atrial fibrillation. From a cardiology standpoint the decision was made to improve rhythm control with sotalol and the rationale for choosing that agent was provided. He experienced a decrease number of episodes of atrial fibrillation that he was correlating with anxiety. 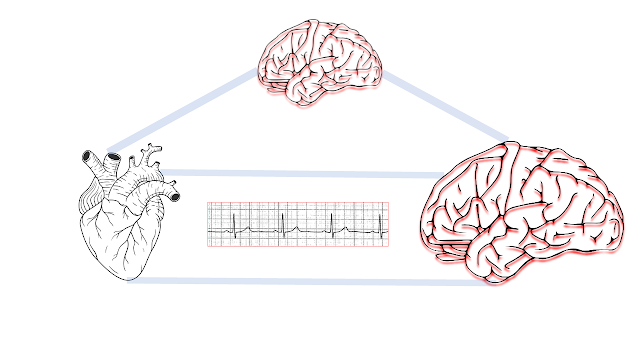 The discussion highlights the correlation of anxiety with atrial fibrillation. That anxiety is a product of experiencing the palpitations and also can be an etiological factor in the episodes of atrial fibrillation. Depression and anxiety also predict who experiences more severe symptoms of atrial fibrillation. Patient medications also discussed in terms of the prolonged QTc interval. The authors comment on the FDA warning about QTc prolongation with higher doses of citalopram. They point out that although citalopram prolongs QTc interval more than other antidepressants there is little evidence that it leads to torsade de pointes or sudden cardiac death. They also point out that the literature shows that when this warning led to decreasing the dose of citalopram the result was no worsening of cardiac outcomes but less than optimal psychiatric outcomes including more frequent hospitalizations and increased sedative hypnotic prescriptions. Overall this was an excellent discussion of the cardiology-psychiatry interface. Psychiatrists are likely to see increasing numbers of patients with atrial fibrillation. I currently see number of patients who are taking multiple cardiac medications. Any patient with this degree of complexity it is important to discuss the possibilities in order to determine the likely sequence of events. In patients with cardiac risk factors who are hypertensive and appear to be describing panic attacks caution is necessary to make sure that there are no underlying cardiac conditions that need to be attended to. As illustrated in this case I have seen patients with severe panic attacks (but no atrial fibrillation) due to the abrupt discontinuations of metoprolol. In patients who have recently discontinued antihypertensive therapy and have panic attacks - clarifying whether there has been any exposure to beta blockers is important. Another relevant factor in this patient's demographic is that the sympathetic tone of the peripheral nervous system in humans seems to increase with age. That may predispose older populations to tachycardia, palpitations, hypertension, and anxiety either directly or indirectly by experiencing the cardiac symptoms. Being able to make an assessment and determination of patient stability, whether or not they need urgent care, what further testing is needed, and what further referrals are necessary is a skill that every psychiatrist should have. See also for the critical references in this case. The human heart line drawing in the above graphic is from Shutterstock per their standard agreement. Holding Tank Or Psychiatric Unit? In the event that it is not obvious, the bulk of my career was spent as an acute care psychiatrist. I staffed inpatient psychiatric units for about 22 years in one of the most acute care facilities in the largest Metro area in the state of Minnesota. That meant that most psychiatric emergencies, especially those involving aggressive behavior were generally brought to this facility and I was one of a handful of inpatient psychiatrists who would be seeing that person. In order to do that work even reasonably well there has to be a reasonable environment. I am an expert in that environment and this post is about how that environment deteriorated as a direct result of government and business intervention that was designed to turn healthcare over to the business community and out of the influence of physicians. 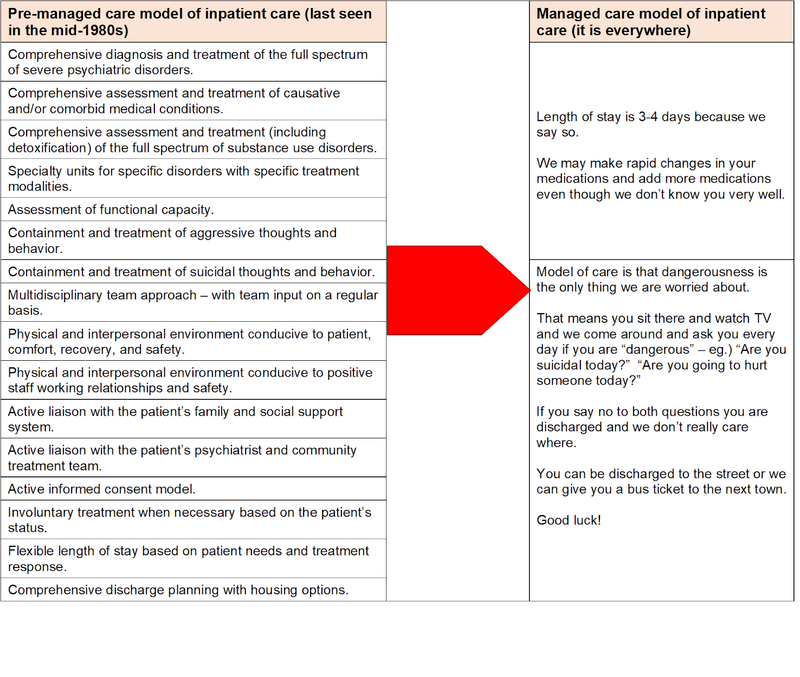 Before I get into those details, let me describe my current perspective on inpatient psychiatric care from the vantage point of an outpatient psychiatrist. In October of this year, I will have been working in an outpatient setting for a total of 10 years. I have seen hundreds of people who were detained or admitted to inpatient psychiatric units over that period of time. I always ask them what their care was like and the reviews are never positive. The most common term that I hear as a description is that it was a "holding tank." They describe incredible boredom, very brief contacts with staff, and the role of the psychiatrist as asking them if they were suicidal or not. Many of them knew they could adopt a game strategy: "I knew if I said I was not suicidal they would let me go and they did." They often tell me that arbitrary medication changes were made to medications they may have been taking for a number of years. Their psychiatrist or physician was rarely contacted. Follow up in these circumstances is not very good. They discharge prescriptions were rarely filled and often they did not get an explanation for the medication changes. My experience trying to get care for people who need inpatient care has been equally unsatisfactory. I have been overruled by non-physicians working in emergency departments when I referred people in who needed acute care. There is nobody in the world or the history of the world who knows more about who needs inpatient care than me. I have been unable to refer people for electroconvulsive therapy with severe depression and suicidal thoughts, even directly to the hospital where I used to work. I have been sent severely ill and unstable people to take care of in an outpatient setting - who should have been treated on an inpatient unit. That level of care in unacceptable to me both as a professional who knows the field and as a family member who wants anyone with mental illness in my family to get the same care and resources as somebody who goes to the emergency department with chest pain. They currently do not. Utilization Reviewer (UR): "Hello I am Dr. X calling to review the care of Mr. Patient Y. Why is he on your inpatient unit?" Me: "He has longstanding depression and for the past two months has been drinking a fifth of vodka per day. On the day he came in his wife found him sitting at their kitchen table with a loaded firearm saying he was going to kill himself. He is currently being detoxified and treated for depression." UR: "He needs to be sent to detox." Me: "The county detox unit is a social detox with no medical coverage and they refuse to take anyone with suicidal ideation or behavior." UR: "He needs to be sent to detox". Me: "Did you just hear what I said?" UR: "Is he suicidal RIGHT NOW?" Me: "He has been under my care for less than 24 hours and at this time is at extremely high risk for immediate relapse and high risk for recurrent suicidal behavior. He needs stabilization." UR: "But is he suicidal RIGHT NOW?" Me: "I don't understand what you mean. He has no access to a firearm right now. He is in a hospital." UR: "Then we are done here. We are not going to cover the hospitalization." Having many conversations like the one above over the years set the tone for the demise of inpatient care. At one point it was easier to recruit psychiatrists to be utilization reviewers because it was an easier job with no liability and predictable hours compared to psychiatrists trying to actually provide the care. This process remains one of the greatest unspoken conspiracies in the history of American healthcare and it is the reason for the red transition arrow in the above graphic. It is also the reason why we began incarcerating people with severe mental illness rather than treating them. It is how county jails are now opening jail facilities that they are calling mental health units. It "saves" any insurance company that adopts these polices a significant amount of money and puts all of the people who should be treated in a safe and supportive environment at risk for that profit to the company. Holding tank is a term, that has come full circle. We owe it all to the managed care industry. I am going to keep this post brief and to the point. This is advice that I routinely discuss with people who tell me that they have suicidal thoughts. In most cases they are surprised about what I tell them. This is a beginning to help people conceptualize suicidal thoughts and frame them in a way that they know what they mean and are confident that they can do something about them. For clinicians, it is also an opportunity to expand the diagnostic interview into a therapeutic intervention. In too many cases, the clinician asks a lengthy series of questions for the diagnostic interview and in some cases and additional set of questions for an assessment of suicide risk or aggression risk. At the end of that process the patient being questioned may be more emotional or feeling drained by the process while they wait for a decision about hospitalization or other treatment recommendations. I have found it is best to have a discussion about suicidal thoughts and attempts right at the time they are being discussed in the diagnostic process. I discuss the following point. Suicidal thoughts are irrational thoughts and it is a normal reaction to experience emotional distress when thinking about them. The best way to think about them is to see them for what they are and that is either a symptom of depression or an irrational thought process. "I am in a hopeless situation and I would be better off dead". "I am worthless to my family and they would be better off without me". "I am not living up to my potential and I have let people down and it would be easier if I was dead." "If I wasn't such a chicken I would kill myself"
"My friend who killed himself had the right idea and I should follow in his footsteps." The general pattern is that the thoughts can get more and more complicated but they always come to the same irrational conclusion. In order to interrupt them - it is important to recognize that they have no particular meaning and that they must be recognized as an irrational thought or a symptom of depression. They have no meaning past that. In my experience most people have not thought of them that way and that is why the discussion is so important. When people see the point of the discussion and recognize the importance of the discussion it is often very therapeutic for them. They recognize for example that the thoughts are transient and that they do not really want to die. They can say that 99.9% of the time they would never seriously contemplate suicide. They realize that they have gone to bed at night with suicidal thoughts and awakened in the morning without them. In many cases they go to work and while focused on their job never experience a suicidal thought. This discussion is a jumping off point where the clinician can discuss a number of ways to intervene in this thought pattern and reduce the frequency and intensity of the suicidal thoughts to the point that they are likely to fade away. The clinician seeing the patient can develop a treatment plan based on this important discussion. That includes addressing any associated diagnosis. But the focus on suicidal ideation and safety needs to continue until the thoughts are no longer a problem. In the case where the discussion is not very productive and suicidal thinking is very prominent a more acute intervention may be required to assist the person experiencing these symptoms. Suicidal thoughts are either a symptom of depression or the product of an irrational thought process. And that means there is hope. The best starting point is to talk with a clinician who has experience talking with people who have these thoughts and giving them advice on how to get rid of them. Will Physicians Be Superfluous In The Recreational Cannabis World? When it comes to advising people to use cannabis for various problems I think the answer is yes. 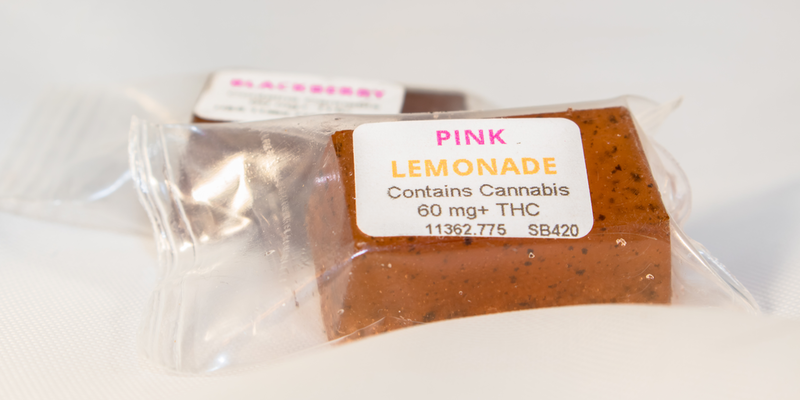 Only a small fraction of people who can access recreational cannabis will be asking physicians for advice on using these products. There are a confluence of reasons but basically they involve cultural factors, political factors, the marketing of cannabis products, expense, and the inconvenience of seeing a doctor for advice and prescriptions when you can get advice from other people including dealers and producers. I would go as far as saying that many of the advisors will be prominent media figures giving advice on the use of cannabis and expanding the marketplace. It follows that the education of physicians should take these factors into account. It is easy to get into disagreements on Twitter. I think most physicians including myself are fairly easy to disagree with because we are not invested in “winning” an argument. As a psychiatrist I know that I certainly am not going to win against an ideologue or somebody was interested in calling me names. This week I got into a disagreement about the role of physicians in medical cannabis. The controversy was sparked by an article written by a medical student about why medical cannabis should be discussed in medical schools. Any reader of this blog knows that my position has been that medical cannabis is basically a political lever to promote the widespread legalization of so-called recreational marijuana. I also believe that every state in the United States will eventually have recreational marijuana. I don't argue that point - I know it will happen. At that point, we will have a better assessment of the risks involved with this policy and they will be significant. The issue this week was a post suggesting that medical students and physicians should have more training in “medical cannabis”. My position was that if most states go the way that Colorado went physicians will be entirely superfluous in that process. It comes from my knowledge of interaction of American culture and the wide availability of recreational cannabis products in the state of Colorado. Medications especially those that are self-reinforcing or put more basically the ones that can get you high, attain mythical status in the American culture. Practically everyone I know hoards opioids. That supply of oxycodone or hydrocodone that is typically given for some type of injury used to be held onto for years. Neighbors would trade pills back and forth over the fence. Opioids no longer sit in a medicine cabinet for years as people actively seek out opioids to get high or sell. Most Americans have a set idea of what opioids they would like for pain and that decision-making process is complex based on their experience and also what they’ve heard from other people. The reality of that process is quite different. When I inquire about the method it invariably comes back to alcohol or some type of consciousness altering drug. I use the term consciousness altering because the drugs used are not necessarily addictive. A good example is a combination of antihistamines and muscle relaxants to cause a state of delirium and sedation. Alcohol is frequently used as a way to address chronic pain. The medical cannabis initiative basically started around the issue of chronic pain and terminal pain. From there it has expanded indications in those states that list their own like Colorado and Minnesota. A lot of people address the issue of chronic pain by altering their conscious state. I certainly have no problem with that in certain circumstances but it is a major unaddressed dimension in the treatment of chronic pain. The American Society of Addiction Medicine (ASAM) has a lengthy position statement (1) on the physician’s role in medical cannabis. They review the need for scientific study and a regulatory process that will provide pure and consistent formulations from companies in a similar manner to the pharmaceutical industry. It is the only way to come up with standardized dosing for specific conditions. The only problem I have with that statement is that it is fairly naive to think that people with a choice between purchasing high cost pharmaceutical grade medical cannabis and recreational cannabis that claims to have the same cannabinoid content will choose the former whether it is “prescribed” or not. That leads me to what I see as the role for physicians in a society that has widespread availability of recreational cannabis. Colorado is a good case in point. Looking at what cannabinoid products are available in a Colorado gas station, it is hard to imagine that people will be consulting physicians for what products to use. I recently found a web site for Colorado gas station cannabis with a wide range of smokable and edible cannabis products. The edible products contained up to 250 mg THC per bar. Physicians currently have the role of certifying conditions for people who will get access to medical cannabis. In Minnesota advice about medical cannabis comes from the pharmacists dispensing it and not from physicians. There is widespread advice available on the Internet about how any interested user could start using cannabis. All of these factors, lead me to conclude that there will be a very limited role for physicians in recommending cannabis or prescribing it. There have been limited medical studies of cannabis and limited indications. There are basically two FDA approved applications and even those medications will be obsolete when people have access to the recreational and less expensive forms. There is no logic at all to declaring a botanical product is on the one hand “medical” and on the other hand “recreational”. A larger role for physicians will be in the treatment of the medical complications from cannabis and people who become addicted to it. As millions and millions of people start using legal cannabis – the number of people addicted to it will also increase. 1. Basic science: neuroanatomy and neurophysiology – the endocannabinoid system’s critical role in basic physiology and clinical correlations. 2. Basic science: pharmacology – detailed pharmacology of cannabinoids. 3. Addiction course- there needs to be a basic 2-week course added to the medical school curriculum on addiction and the prescription of drugs that reinforce their own use with necessary risk mitigation techniques. Many medical schools have a 6-week course in psychiatry that is usually based on an inpatient unit. I recommend adding two weeks to that with experience in an addiction clinic. I currently work in a program where we provide two week training programs to residents, medical students, and physicians for this purpose. 4. Elective course - experience in specialty programs where there may be more cannabinoid use (pain clinics, palliative care, toxicology) that can be tailored to a student’s interest. 5. Clear identification of resources for further study - during lectures I always mention the major addiction texts and their organization. Additional state-of-the art references could be posted in a self study syllabus - primarily because a clinical focus would not allow enough time to cover the necessary basic science. 6. Advice on the regulatory burden - in the foreseeable future that means familiarity with the statutes and regulations in each state. Medical schools generally do not teach these practical aspects of medical care. States recognize that physicians can't prescribe a CSA Schedule 1 drug, and limit the physicians role to certifying the conditions that qualify the patient for medical cannabis. Some states require physicians to get approval for that role. That seems like overkill to me. Any medical record with the qualifying condition listed should lead to certification and would probably be more objective. Any effort beyond what I have listed above is probably unrealistic based on the fact that this is (along with supervised practice) is the basic approach to any medication that physicians prescribe. I am not aware of any medical school initiatives to intensify the training for opioids, benzodiazepines, or stimulants but would appreciate hearing about any of those courses. In the course where I teach, we see medical students, residents, and physicians from all over the US and Canada. In closing are there possibly ways where physicians will end up in a more central role? Only if the FDA and other regulatory bodies put them there. For example, in my post on Epidiolex I asked about the patentability of CBD products, specifically this one that was an extraction product of cannabis. Physicians prescribing these FDA products need to learn to prescribe them like any new product, but is there a chance that FDA approved and patented cannabis products are a threat to the products available for recreational and medical use from dispensaries? There is currently a story circulating saying that the FDA is going to ban all CBD oil use except for Epidiolex and it will cost all users $32, 500 a year. That would favor the pharmaceutical industry but I don't think that will happen. It is more likely that other products designed to affect the endocannabinoid system will be developed like standard pharmaceuticals and that will lead to physician prescribing - if there is anyone left at that point who is not using recreational cannabis. I recently encountered an interesting twist by a cannabis advocate in a state where recreational cannabis is not yet legal and medical cannabis is strictly controlled as non-smokable products. He argued that the terms recreational cannabis and medical cannabis should be changed to cannabis for non-prescription and prescription use. He argued that this would normalize the political process since nobody designates alcohol as recreational or medical. The obvious reason is that alcohol has extremely limited roles as a medication. The term medical cannabis may have lost some of its luster as a politically correct approach. Downloaded from Shutterstock per their standard licensing agreement.